You don't see the birds until you get out into the unmowed field of tall grass. Even then, you hear them before you see them. But only if you're listening carefully. The bobolink has a bubbling sound, but it's hard to tell where it's coming from. Some people simply don't notice it. But if you go stand out in a bobolink field in spring, several males may circle around you and give you a good listen. The grasshopper sparrow sounds like—well, a grasshopper. It's just a buzzy trill. The one at right was bathing in the dew captured on the umbels of wild parsnip that has invaded the prairie. It's not a native plant, and it's considered a pest, but it makes a great bathtub for the grasshopper sparrows. Henslow's sparrow is even more minimal. 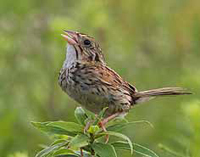 I recorded a Henslow's sparrow's song in Jefferson County, Iowa, on June 6, 2006. I processed the recording using Raven Lite software. Here are some tips on learning birds' songs. Text © 2006-2012 by Diane Porter. Photos of bobolink and sparrows © 2006-2012 Michael & Diane Porter. Read what Michael and Diane recommend as the best binocular for particular needs — closest focusing, pocket-friendly, for glasses, most economical, or all-around best binoculars. Birding By Ear CD teaches how to see birds by ear.